Have you ever wondered how some of the food processing methods we use today were developed or “discovered”? Most of us are familiar with “pasteurization”. We also know that it was named after Louis Pasteur, a famous and remarkable French scientist. But what prompted Pasteur to actually roll up his sleeves and get working on it? Back in the early 1860’s, the French wine industry was suffering from a mysterious problem that caused the wine to spoil. This was a crisis of epic proportion affecting the favourite beverage of the entire nation. It also threatened to ruin France’s exports to other European countries. Emperor Napoleon III was so concerned that he called in Louis Pasteur to investigate. Pasteur found that moderate heating of the wine to just over sixty degrees Celsius for a given period of time was sufficient to eliminate the problem. He explained that undesirable microorganisms in the wine were causing it to sour. Later, Pasteur also applied his heating process to beer in order to destroy microorganisms which were causing it to spoil. Today, milk is probably the most commonly pasteurized food product. In spite of the fact that the process bears his name, as far as milk was concerned, it appears as if Louis never touched the stuff. All milk sold commercially in Canada and many other countries of the world must be pasteurized. The technology has advanced significantly since the 1860’s. The original batch process for pasteurizing milk required it to be heated to 63 degrees Celsius and held at that temperature for 30 minutes. This was done in large kettles over a fire, or on a stove. Needless to say, there were issues with off-flavours developing. However, the risk of illness was significantly reduced, especially when using the pasteurized milk to feed infants. Today, sophisticated heat exchange processes can raise the temperature of the milk quickly. Typically, the milk is heated rapidly to 72 degrees Celsius. After heating, the milk is passed through a holding tube which is sized to give it a holding time of fifteen to thirty seconds. It can then be cooled rapidly back down to about 4 degrees Celsius. This is called high temperature-short time processing, or HTST, for short. A critical control point in the pasteurization process is the temperature of the milk at the end of the holding tube. If the temperature is not at 72 degrees Celsius (or above) at this point, a diverter valve is automatically activated. It redirects the flow of milk back to the start of the process and prevents it from going any further forward. In this way, milk that has not received sufficient “time at temperature” will not be packaged. Samples of milk are tested to determine if they have been adequately pasteurized. This is usually done through independent testing laboratories or in government labs. Some of you may be familiar with milk packaged in one-litre aseptic cartons, much like drink-boxes. This milk has a longer shelf-life than milk processed using the HTST method, and can be kept in the unopened cartons at room temperature for several months. In this process, the milk is heated to about 150 degrees Celsius while under pressure. The holding time for this ultra high temperature (UHT) process is only about four seconds in duration. 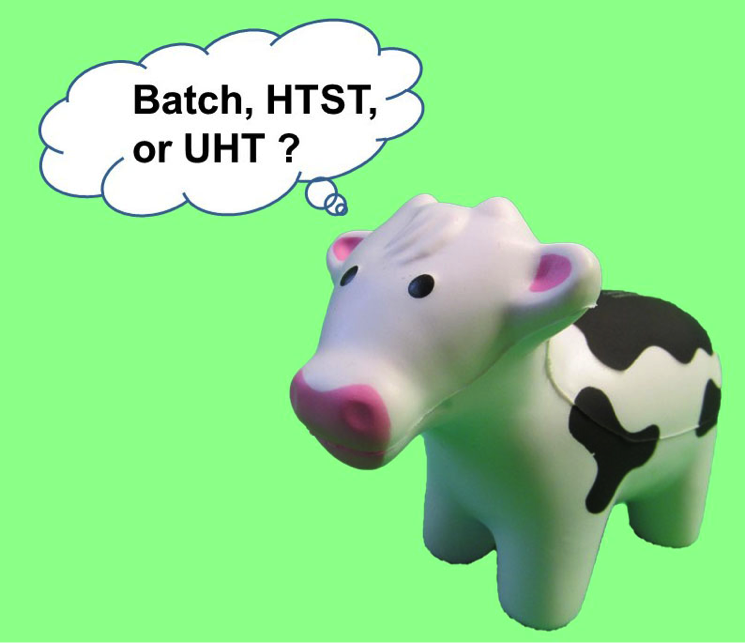 UHT milk is popular in Europe where refrigerators are not as large as those in North America, and refrigerated storage space is at a premium. Pasteurization has contributed greatly to the reduction of food-borne illnesses attributed to milk and other liquid products. Hopefully, this brief description has provided a bit of insight into the process. There are several processes by which milk can be pasteurized.